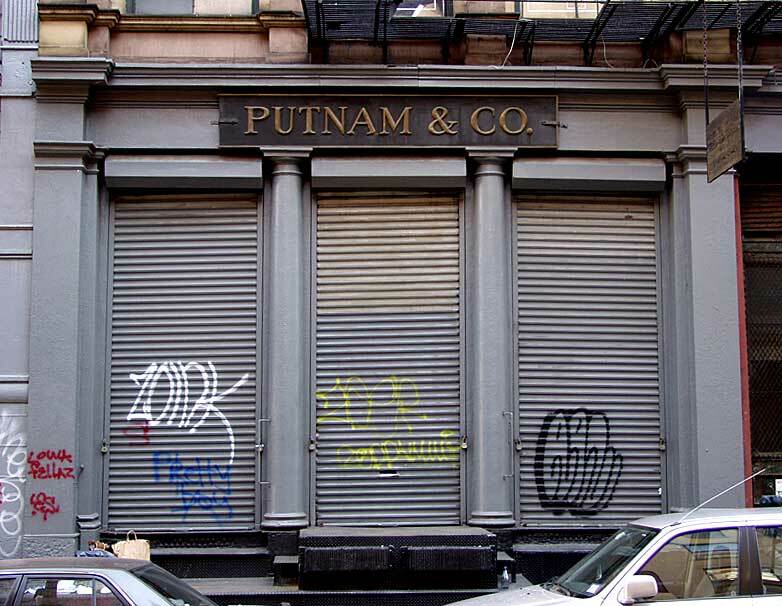 Putnam & Co. were hardware dealers and manufacturers of rolling ladders, who began as Putnam, Pooler & Co. at 150 Nassau St., New York City, in 1897. Samuel W. Putnam Jr.'s partnership with Charles R. Pooler seems to have lasted only the single year, 1897. In 1898 Trow's New York City Directory listed the company as "Putnam & Co., hardware." Putnam & Co. were located on Nassau St. until 1905, then moved to 244 Water St. The company relocated again in 1917, when they moved to 32 Howard St. The founder was Samuel W. Putnam, Jr. (1870-1949). His obituary, New York Times, 4 Jan. 1949, read, "Samuel Putnam of Leonardo, N. J., inventor of a rolling ladder much used in stores and libraries, and formerly for fifty years, 1896-1946, president of Putnam & Co., manufacturers, died here yesterday in the Presbyterian Hospital at the age of 78. He was born in this city and received his higher education at City College. Surviving are his widow, the former Mary E. Nugent of Salt Lake City; a daughter, Mrs. Dorothy P. Brodsky, and two grandsons, J. Putnam Brodsky and Robert P. Brodsky. Mr. and Mrs. Putnam celebrated their fiftieth wedding anniversary in 1942." From around 1910 or so Samuel Putnam's partner at Putnam & Co. was Morris Kornfeld (1888-1943). He was an officer in the company from the time it was incorporated in 1918 until his death in 1943. Samuel Putnam's patent for a Trolley Ladder patented 27 June 1916 is available on google patents. Also available is his patent for a Removable Ladder Step, patented 18 Jan. 1921. The business of Putnam & Co. was described as follows in Hardware Dealers' Magazine, May, 1918, vol. 49, pg. 1069, "Putnam & Co., No. 32 Howard street, New York City: ladders and specialties. The Putnam ladders are well known goods. They make a very complete line of sliding store ladders, step ladders, extension ladders and overhead tracking systems for warehouses, factories and stores. Putnam & Co. are also sales agents for the Allith-Prouty Co., Danville, Illinois, whose line of door hangers, track, fire door fixtures and hardware specialties are so well known to the trade. Another important line on which they are distributors to the Metropolitan district is that of M. B. Schenck & Co., Meriden, Conn., whose "Gem," "Harvard" and "Yale" casters have been so extensively advertised and universally sold." This ad for Putnam & Co. appeared in the 1926 Manhattan telephone directory. In 2013 the Putnam Rolling Ladder Company celebrated its 108th year. They remain in business at 32 Howard St., New York City. Visit their website at putnamrollingladder.com Their "about us" page includes the information, "Father-and-son ladder leaders Warren and Gregg Monsees. Founder Sam Putnam sold his company to Warren Monsees's aunt and longtime Putnam employee in 1946, but the classic rolling ladder hasn't changed." Some of the history of the company on the Putnam website includes, "For 100 years, the company that Samuel Putnam founded in lower Manhattan has offered trestle ladders, step stools, pulpit ladders, industrial steel ladders and, most important, the famous 'Classic No. 1' - the rolling library ladder. 'The design hasn't changed since 1905,' observes Putnam's friendly, sandy-haired president, Gregg Monsees. But customers have. Putnam have always made rolling ladders for residential use, but for half a century those orders mostly came from a few high-brow architectural firms like McKim, Mead and White, who designed wood-paneled home libraries. From the 1920s through the 1970s, Putnam's biggest customers were the phone company, dry-goods stores, and clothiers like Brooks Brothers. In the late 1970s, industry orders slowed to a trickle. 'But we got lucky,' notes Monsees, recalling that the building and renovation boom started about the same time. Unlike AT&T, homeowners wanted to climb to the top in style. Before 1980, Putnam made all their ladders from red oak. Today, they also offer ladders in cherry, ash, hickory, beech, walnut, birch, maple, teak, and mahogany. But some things stay the same. The factory is still in the Bushwick section of Brooklyn, and its foreman has been with the company since 1956. Ten years ago, Gregg Monsees took over the family firm from his father, Warren, who had run it since 1950 and still comes to the office in downtown Manhattan almost every day."